Intestinal infections can be mild or serious. Various treatments can help. If symptoms persist for several days, it is important to seek medical assistance. There are multiple organisms including yeast, fungus, mold, parasites or bacteria that can contribute to an intestinal infection. These can be picked up from the food you eat or due to poor hygiene that allows you to come into contact with pathogens in your mouth. The severity of the infection will depend on what type of pathogen has caused the infection. Diagnosing the infection based on your symptoms will help your doctor narrow down the likelihood of different types of infections you could be suffering from, so you may receive adequate treatment. The most common cause is pathogens that enter your mouth. While other causes, such as contacting with polluted water and poor hygiene can also trigger it. Pathogens - Infections are caused when pathogens enter your system and begin irritating the tissue in your digestive tract. The gastrointestinal tract can become inflamed and sore, which typically begins to cause additional symptoms of digestive distress. Pathogens which cause intestinal infections are ingested, typically from a contaminated food source. Spoiled dairy products, unpasteurized dairy products, spoiled meat, contaminated shellfish, or any food which was exposed to microbial pathogens and not sterilized properly with the cooking process can increase the risk of developing an infection. Contaminated water - Coming into contact with contaminated water can also lead to an infection. Water from natural sources such as lakes should not be consumed unless it has been thoroughly boiled to sterilize it. Swimming pools can also become infested with microbes which can cause infection if they are not sanitized properly to accommodate the large population. Poor hygiene - This can also spread microbes that cause infections. Failing to wash your hands after visiting the restroom is a common way to contract an infection. Touching surfaces, silverware or food after failing to wash your hands increases the risk that others will come into contact with these microbes, spreading the risk of disease further. If you are undergoing an infection, you may have some of the symptoms given below. Sinus distress - Intestinal pathogens will often affect other parts of the body. You may develop a sinus infection, runny nose or coughing as the infection takes hold. Loss of appetite - Your system will begin to shut down as it becomes inflamed. Loss of appetite is a common sign of an infection as well as other types of digestive distress. Nausea - A loss of appetite is frequently accompanied by nausea, commonly described as a "queasy feeling". Abdominal Pain - As the infection becomes more severe, it is common to feel pain or swelling in the abdominal area. The severity of this pain will depend on the location and cause of the infection. Cramping - Bacterial infections will commonly cause cramping in the abdomen. Cramps will frequently last for 3-4 minutes at a time, and may become progressively severe. 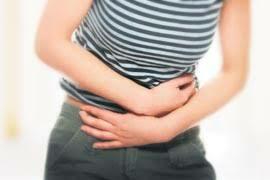 Constipation - If you have not been eating regularly, you may begin to experience constipation. This is also common if you have become infected by intestinal worms. Irritable Bowel Syndrome - If parasites in your intestines have become attached to the walls it can cause irritable bowel syndrome. Diarrhea - As the pathogens move farther into the digestive tract, they may cause diarrhea as the body attempts to rid the body of these irritants. You may also begin to experience diarrhea as you become more dehydrated. Depression - Those suffering from a yeast infection may experience an increased risk of depression. Sleep Disorders - Discomfort associated with infections can make it difficult to sleep. This can also be a sign that the liver is being overworked as it attempts to rid the body of the infection. Teeth Grinding - In rare cases, those who are suffering from an infection may grind their teeth in their sleep. Headaches - Dehydration or the presence of irritants such as yeast in your system increases your risk of constant headaches. Skin Rashes - Some patients may experience an itching or burning sensation on the skin as the infection moves throughout their body. Suffering from an infection can be very painful and annoying, so here offers you several helpful methods to treat this condition and speed up the recovery. While you are suffering from an infection, you must take care not to spread this infection to others. Wash your hands regularly, especially before cooking or eating and after using the bathroom. Wash all of your food carefully and cook it thoroughly before consuming to help reduce the risk that you will be put into contact with additional microbes that could worsen your condition. As your system attempts to recover from an infection, it is important to reduce any stress on these organs. Patients are frequently put on a liquid diet to ensure that they can remain hydrated and gain the necessary electrolytes to keep their system in balance. As your ability to eat solid foods returns, your doctor will encourage you to eat fruits and vegetables that are high in nutrients to help gain back the vitamins and minerals you have lost while limiting your diet. Avoid foods that are hard to break down such as red meat until your system has recovered. Also avoid foods that are hard on the digestive system such as dairy products or spicy foods until you are feeling well again. If you are experiencing severe symptoms including extreme vomiting, diarrhea which contains blood, weakness, or signs of dehydration, it is important to seek medical attention right away. You should also seek medical if your regular symptoms have gone on for more than three days without relief. Your doctor may ask for stool samples to determine what types of pathogens have infected the system. If your symptoms are severe, your doctor may prescribe medication to help stop your diarrhea and vomiting. Do not take medication to prevent these symptoms without medical instruction to do so. Your body may need to continue this purging cycle to remove the microbes causing the infection. In severe cases, you may need intravenous therapy to prevent extreme dehydration from your purging.